Milk can be derived from sources besides typical farm animals; for example, coconuts also produce milk. This milk is made by squeezing the pulpy meat inside of coconuts. Coconut milk can be used as an alternative beverage for those who are lactose intolerant and is often included in recipes as part of a sauce, marinade or curry. 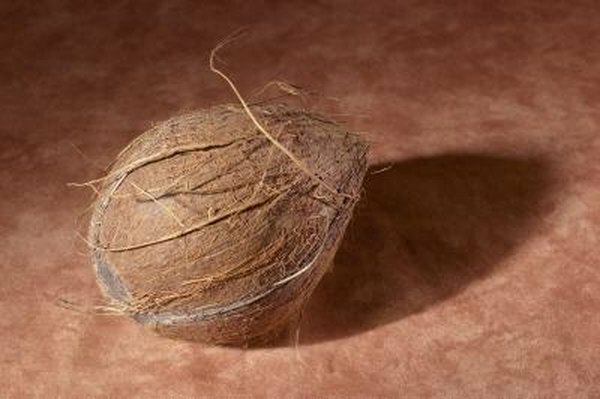 Although versatile, coconut is not a good choice for dieting, because it is high in calories and fat. Coconut milk is a poor choice for weight loss due to its high calorie content. One cup of this milk contains 420 calories, or 21 percent of the daily suggested intake. This amount is more than five times the amount in skim milk, 80 calories. Switching from drinking one cup of skim milk to one cup of coconut milk each day would cause you to consume an additional 2,380 calories per week, enough to gain more than 2/3 of a pound. Coconut milk is high in fat, as 1 cup contains 42 g. Although some dietary fat can be beneficial, the majority of the fat, 36 g, in coconut milk is saturated fat, a type of fat that can increase your risk of heart disease; the American Heart Association recommends limiting daily intake to 16 g. Coconut milk is purported to have weight-loss benefits due to the fact that the saturated fat comes in the form of medium-chain triglycerides, a type of fat that may encourage fat oxidation, or burning. However, research from the April 1996 issue of the Journal of Lipid Research notes that the majority of your diet would have to be comprised of medium-chain triglycerides to achieve any weight-loss benefit. Coconut milk is low in carbohydrates, with 9 g per cup. This is 3 g fewer than the amount in 1 cup of skim, so coconut milk could be more suitable for a low-carbohydrate diet. However, the dramatically higher calorie content may limit coconut milk's usefulness on such diets. Coconut milk is low in protein, with just 3 g per cup. This amount is less than half of what a cup of skim milk provides, 8 g. Protein is required for optimal health, and research from the May 2008 edition of The American Journal of Clinical Nutrition indicates that diets high in protein can be more effective than lower protein diets for weight loss. Coconut milk is not a good source of vitamins and minerals, as it contains just 6 percent of the daily suggested intake of iron. Vitamins and minerals perform a number of vital roles in your body, and some may aid in weight loss; a January 2011 study from Clinical Nutrition found that vitamin D and calcium improved weight loss and feelings of satiety; both nutrients are present in dairy milk. The American Journal of Clinical Nutrition: Protein, Weight Management, and Satiety; D. Paddon-Jones, et al.